A vision statement bears a company or entity’s dream destination, and it maps out in writing the direction that the company plans to take to get to this point. It is representative of what the company does and what it stands for, and is indicative of what the company wishes to achieve for its future. Crafting a great vision statement is integral to a company as it will be associated with its identity, and will guide the people that form part of the company on how they should conduct their daily tasks and activities accordingly. Like in these Sample Statements, it has to be purposeful and prospective, and should be written according to the passions of the company and how the company plans to take these to the utmost. 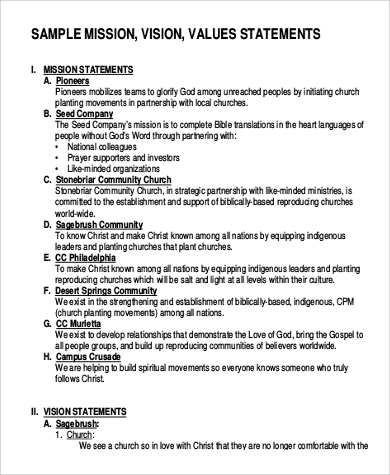 Take reference from and be guided with these templates. 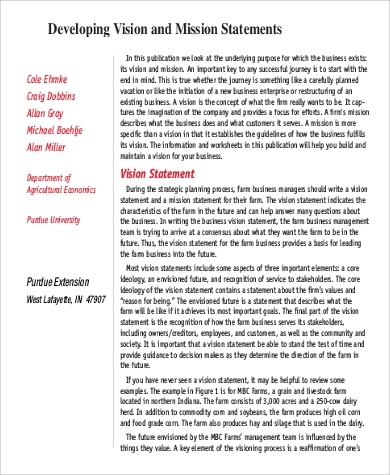 All businesses, institutions, and even nonprofit groups have vision statements. 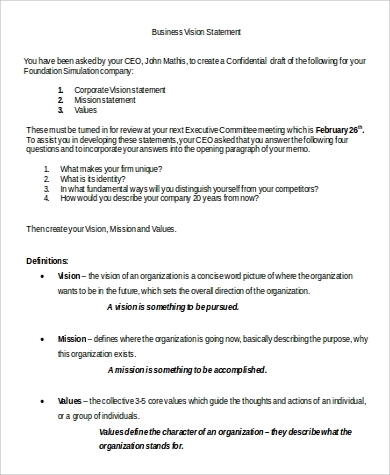 The vision statements articulate for the members of the group or company what they are all working toward. Hence, vision statements should seek to motivate group productivity toward the achievement of their objectives. 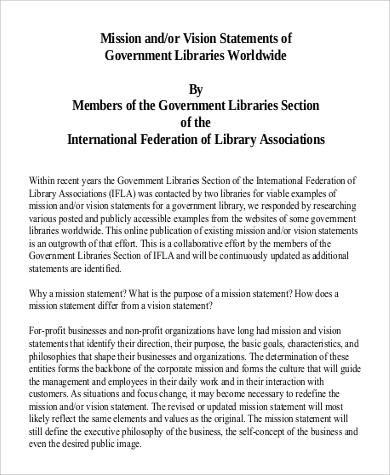 Vision statements are to fuel the members’ work and performance for their institutions. 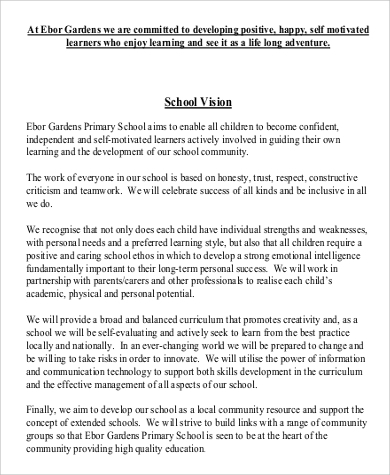 Simultaneously, a vision statement also presents the group or company to the public; its nature and thrust, what it works for, and what it hopes to achieve. Because a vision statement becomes part of the identity of the group, it is important to tailor-fit its writing to what the company is all about. 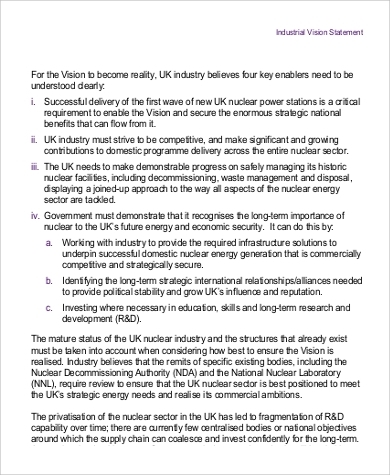 The templates below show examples of the vision statements of various groups, also indicating the importance of the vision statements to their institutions. Vision statements are thus different from any other statements that come from a company. For example, these Sample Income Statement Examples. 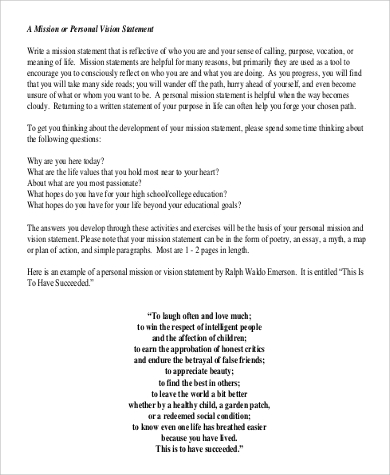 The vision statements envelope the entire group and defines how it should work for its goals, while the latter type of statements are those that are produced from the work itself. Part and parcel with vision statements are a company’s mission statements and values. These statements do serve significant purposes for companies and are not just there for show. These three provisions guide companies and members, and as detailed above, the contribution of vision statements to this purpose is to provide an image of the future that the groups wish to achieve for themselves. 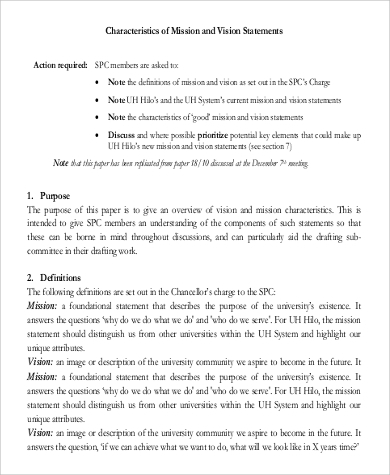 To accompany the vision statement that you have just written for your institution, create a mission statement and be guided with these Sample Mission Statements.